The bird had apparently crashed into the window of Sally Arnold's Kendal home, leaving the bizarre image - complete with eyes, beak and feathers. Mrs Arnold said she could find no sign of the owl, so assumed it had flown off without serious injury. She said: "Our first concern was for the welfare of what we suspected was an owl and we opened up the window to check if it was still around. "Fortunately, there was no sign of the bird and we can only assume that it had flown away probably suffering from a headache." 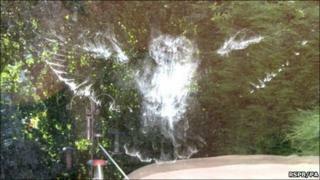 Val Osborne, head of the RSPB's wildlife inquiries team, said: "We don't very often see an imprint of a bird that's flown into a window that's this clear and where it's pretty obvious exactly what kind of bird it is. "This would have been very uncomfortable for the bird but thankfully it looks like it survived as Mr and Mrs Arnold couldn't find it anywhere close by. Sadly, many birds aren't so lucky." Birds often collide with windows or start to attack them, especially at this time of year with so many young birds around, the RSPB said.